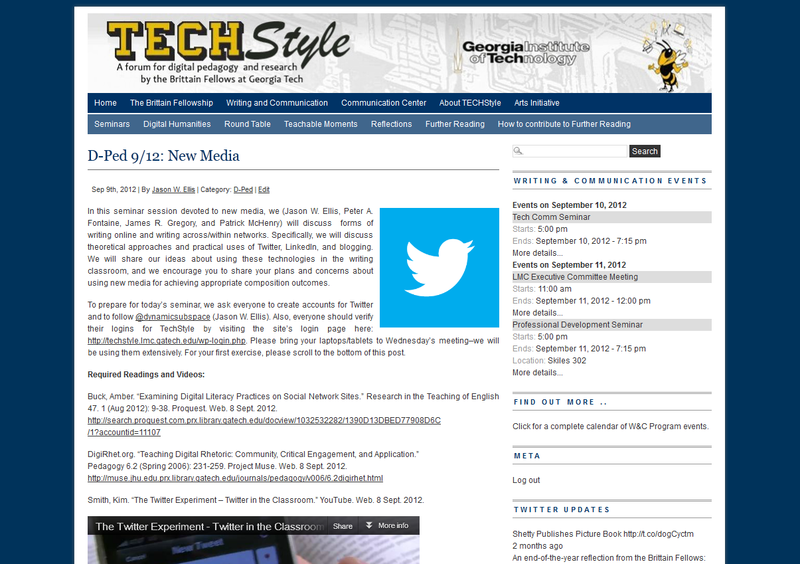 There are some exciting things going on in the School of Literature, Media, and Communication at Georgia Tech. On 9/12/2012, Peter A. Fontaine, James R. Gregory, Patrick McHenry, and I will be hosting a seminar for the Brittain Fellows on using new media in the classroom. While discussing the theory and praxis behind new and social media in the composition classroom, we will specifically focus on technologies by Twitter, LinkedIn, WordPress, TodaysMeet, Storify, and Wordle. Learn more about what we will cover by visiting TechStyle here. Previous Post 2013 SFRA/Eaton Conference Deadline for Abstracts is Sept 14!